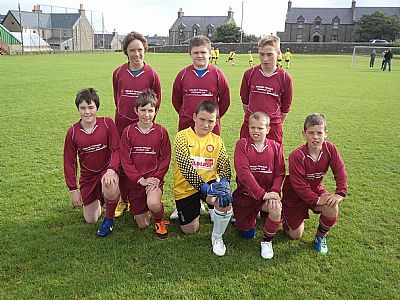 With the outdoor youth football season drawing to an end the annual Under 12’s club competition with visiting Shetland teams Lerwick Rangers and Scalloway took place at Picky last Saturday 8th and Sunday 9th September. Conditions were good on both days and allowed for some excellent football to be played. The competition was split into A and B leagues with six teams playing in each league. After the first day’s matches Thorfinn and Scalloway led the A league, after winning their first three matches. Both teams looked sharp although Scalloway had to fight hard against Stromness for a narrow 1-0 victory and Thorfinn let a comfortable lead slip against East United and were fortunate to escape with a 3-2 victory. In the B league Thorfinn B were even more impressive with three crushing victories against their opponents setting them up for the final day. The Sunday proved to be a perfect day for football with no wind and the late summer sunshine bathing Picky. The A league looked like it was heading for a final match decider between Thorfinn and Scalloway but East Utd spoiled the script when they turned over Scalloway 4-1 in the first match of the day. With Thorfinn comfortably winning their final two matches including a 5-1 victory against Scalloway they emerged as deserved winners of the A league. Thorfinn B stormed to a further two victories in the B League and ended up the highest scorers over the weekend averaging over 6 goals per match. At the end of the competition OYDG Chairman Stephen Crawford congratulated all the teams on playing some excellent football, and in particular Thorfinn for their double triumph. He thanked the Shetland teams for coming down, Picky groundstaff for preparing the pitches, and all the referees who had helped matches run smoothly. Before presenting medals to the winning teams he also commented on how pleased he was to see a number of all girls matches being played on the Sunday, and he hoped that with the continued assistance of the Orkney Women’s Football team, the taster session would lead to more regular all girls football competitions in the future. 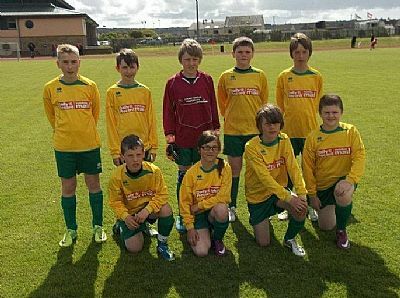 Three Orkney Under 12 teams – East, West and Kirkwall – competed for the Andromeda Cup against 8 Shetland clubs during their trip to Shetland on the weekend of 1/2 September. 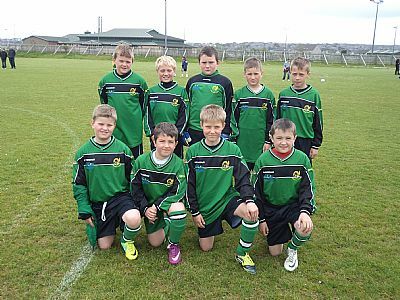 This a competition where Orkney have tasted success in over recent years and as the competition progressed the Orkney boys looked highly likely to repeat previous successes with both Kirkwall winning Group 1 and East ending up as runners up in Group 2. Unfortunately this meant that both the Orkney teams had to face each other in the semi final, but at least it guaranteed an Orkney presence in the final. This match turned out to be a very tight affair with Kirkwall eventually emerging victorious after a penalty kick shoot-out. 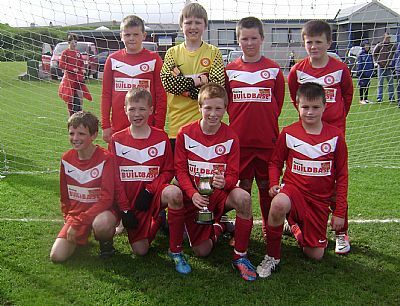 In the final Kirkwall faced Lerwick Spurs who were the most impressive of the Shetland sides. The final turned out to be an equally tight match. Although Callan Jessiman give Kirkwall the lead in the first half this was cancelled out by a Spurs equaliser in the second half. With the match ending all square it was straight into a penalty kick shoot out. This turned into a marathon session with the penalty takers being so successful that the referee eventually had to extend the distance for the penalty kicks to make it harder for the teams to score. Kirkwall held their nerves to eventually record an incredible 18-17 victory on penalties much to the delight of the Orkney players and supporters. As a warm up to the John W Shearer Cup the Orkney and Shetland players took part in a 7-a-side competition at the Picky Outfield on Saturday 9th June. 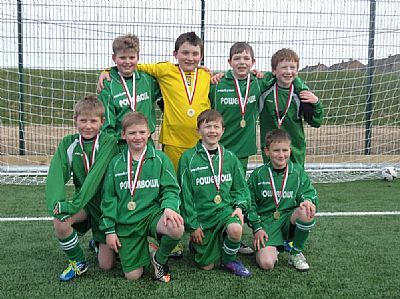 Five teams took part in a league format with 3 representing Orkney and 2 from Shetland. This proved to be a very closely fought competition, with the early results suggesting that Shetland Navy would be the team to beat as they defeated both Orkney Wine and Orkney Green in their opening games. Results for the homes teams were to improve however and with the final two games of the competition to be played 3 of the 4 teams were in with a chance of winning the competition. A win for Orkney Wine would have guaranteed them victory in the competition but in their final match they were facing Shetland Blue who were also in with a chance. In the other match also being played at the same time Orkney Yellow needed to win against Orkney Green and hoped that Orkney Wine dropped points against the Shetland team. Advantage went to Orkney Yellow when they took the lead in their match and Orkney Wine conceded an early penalty against Shetland Blue. However the Green team equalised as did the Wine team in their match to leave the result of the competition in the balance. Orkney Yellow then took a 2-1 lead in their match leaving Orkney Wine needing to score a winning goal in their match to win the league. 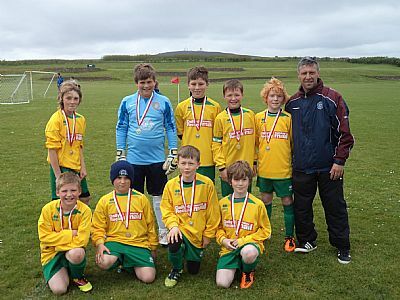 Whilst they had a number of chances near the end of the match they were unable to score the vital goal against a determined Shetland team in what was the best match of the tournament. This left Orkney Yellow as the narrow victors of an excellent competition. The day concluded with Stephen Crawford OYDG Chairman congratulating the teams on such an exciting competition, thanking the Picky Groundstaff, and the Shetland teams and coaches for coming down. 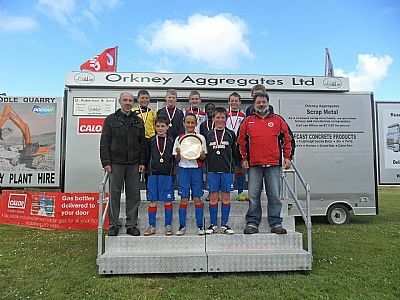 Shetland coach Archie Constable presented medals to the winning Orkney team. OYDG would also like to thank the two referees for the day – David Ryrie and Lennie Merriman. Orkney Green 1 Shetland Blue 1; Orkney Wine 1 Shetland Navy 2; Orkney Green 1 Shetland Navy 3; Orkney Yellow 1 Shetland Blue 0; Shetland Blue 3 Shetland Navy 0; Orkney Wine 1 Orkney Yellow 0; Orkney Yellow 3 Shetland Navy 0; Orkney Wine 3 Orkney Green 1; Orkney Green 1 Orkney Yellow 2; Orkney Wine 1 Shetland Blue 1. 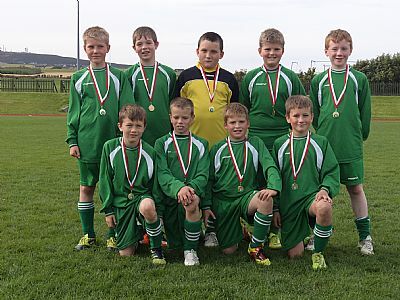 The 2012 Northern Counties Under 12's 7-a-side competition was played in sunny but cold conditions at Picky last Saturday. This is one of the top tournaments of the outdoor youth football season with teams from Orkney facing visiting teams from Shetland, Caithness and Inverness Caley Thistle. 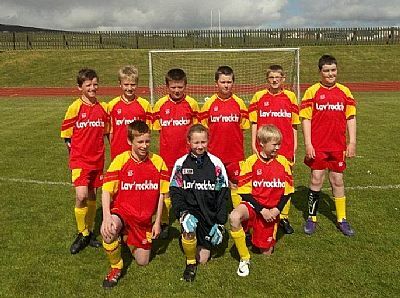 This year Orkney and Shetland fielded three teams each and Caithness and Caley Thistle two teams, with the ten teams being split into two groups. Caley Thistle have made a habit of winning the competition in recent years, and this year was to be no different with both Caley teams topping their respective groups with 100% records to ensure an all Inverness final. 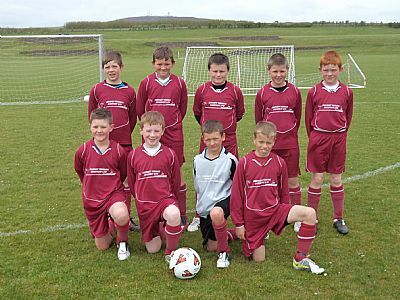 The Orkney teams competed well with Orkney Red finishing the best placed of the local teams. 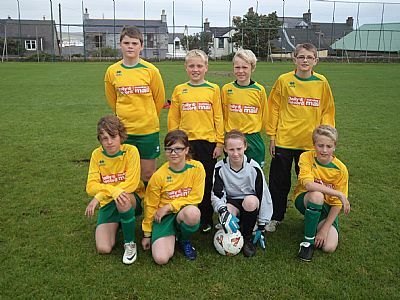 A special mention goes to the young Orkney Wine team who beat their older and more experienced Orkney Yellow team mates and were the only team to score a goal against the eventual winners. In the all Inverness final it was Caley Thistle Whites who scored a goal in each half to beat their teammates to clinch the Northern Counties title for the third time in a row. This was once again an excellent competition with Caley Thistle setting a standard which their northern neighbours just couldn't quite match. At the end of the competition Stephen Crawford, OYDG Chairman, praised the high standard of football on display and thanked the referees, groundstaff, visiting teams and Orkney Aggregates who were sponsoring the tournament and introduced Roy Brown representing the sponsors who presented the trophy and winning medals to the victorious Caley Thistle team. Orkney Yellow 1 Shetland Blue 0; Orkney Wine 1 ICT Blue 2; Caithness Red 2 Orkney Yellow 2; Shetland Blue 3 Orkney Wine 0; ICT Blue 4 Caithness Red 0; Orkney Yellow 1 Orkney Wine 3; Shetland Blue 2 Caithness Red 0; ICT Blue 2 Orkney Yellow 0; Orkney Wine 0 Caithness Red 3; Shetland Blue 0 ICT Blue 3. 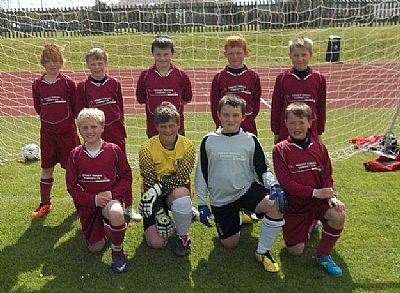 The youth outdoor football season kicked off on Saturday 31st March with the annual Under 12’s club competition centred around the visit of the Whitedale club from Shetland. Ten clubs including two from Whitedale took part split into an A and a B league. This was a first for OYDG with the new Stromness all weather facility being used for the first time for a competition. Weather conditions overhead stayed dry and the bitterly cold north wind did not deter the players who provided an excellent standard of football. A sizeable number of spectators were thankfully provided by a steady supply of hot drinks by the Piece Box catering van. The A league saw one of the most competitive tournaments for years with not much to choose between the five participating teams. Goals were in short supply and eight of the ten matches were either goalless draws or 1-0 victories. It was no surprise therefore that the league went to the wire with Thorfinn A needing a victory in the final match to pip Stromness A on goal difference. It was not to be however as they were held to a goalless draw by East United A and Stromness emerged winners. 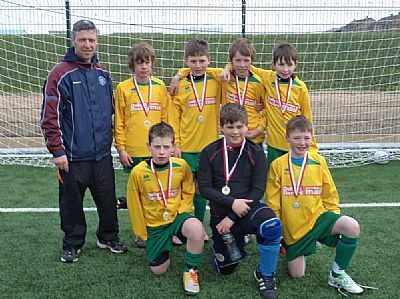 This victory continued Stromness’s excellent start to 2012 which has already seen them clinch the Primary Indoor football title. East United B 1 Stromness B 1; Thorfinn B 3 Whitedale B 1; Thorfinn C 0 East United B 2; Stromness B 0 Thorfinn B 1; Whitedale B 0 Thorfinn C 1; East United B 0 Thorfinn B 1; Stromness B 1 Thorfinn C 2; Whitedale B 0 East United B 2; Thorfinn B 4 Thorfinn C 0; Stromness B 1 Whitedale B 0. At the end of the competition OYDG Chairman Stephen Crawford thanked Whitedale for coming down for their annual trip and providing good competition in the curtain raiser to the new outdoor season. 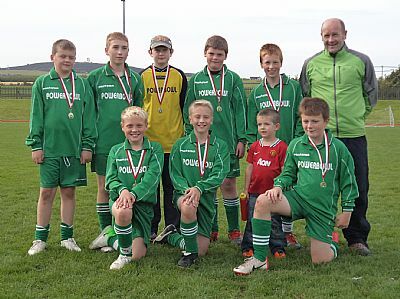 Commenting in particular on the closeness of the A League he congratulated all the teams on the standard of football before presenting medals to the winning Stromness A and Thorfinn B teams. The Whitedale coaches also picked Oskar Stout from Thorfinn A as the Orkney Player of the Tournament, and generously presented him with a gift. Well done to both teams and Oskar. Thanks are also due to the three referees for the day; Shane Stanger, Jimmy Leask and Lennie Merriman. On Sunday the Shetland visitors took part in a fun competition in Dounby which was won by East United who beat Dounby in the final. OYDG would like to thank Dounby for hosting and running this competition, and look forward to welcoming Whitedale to Orkney again next year.